Follow the adventures of a steampunk production in needles and artifice. Who Are The Ladies Of Mischief? A lovely long weekend to you my colleagues! As always, I’m quite happily spending mine poring over Ladies of Mischief artifacts for you. And I have a very exciting update today regarding Miss Coraline Hackworth’s arrival at The Great Exhibition. As you recall, she traveled all the way from London with a pit-stop in New York for some exploration and tea, followed by the mid-flight discovery of a charming stowaway. Let’s see what discoveries the Exhibition itself holds…. The Great Exhibition is fabulously exhilarating! The building itself is a mechanical marvel; the great hall doors have an astounding clockwork frame that will open the doors at the touch of a button. They seem ridiculously inefficient, but the makers swear that such “automatical doors” will be all the rage in the finer cities of the world. I wonder what impact such a change would have on the door-opening etiquette of the day? Fortunately Mr. Thistleby is possessed of wisdom as well as wit, and he merely bowed and stood aside as I pressed the button. What noise! Steam flew out of whistling tubes while gears clicked and ground together. The massive spectacle ended with the doors sliding sideways in a very unusual fashion. While we passed through the doors, I closely examined the frame, as it had some very interesting construction. I became so engrossed that I didn’t notice as the doors started closing again, and nearly became trapped when they closed on my bustle. A vigorous tug from Mr. Thistleby was required to dislodge me. I’ve always found the bustle to be a rather silly fashion but I have never before been endangered by one. I find myself pondering the practicality of an external, detachable bustle. After all, a Lady of adventure must not be so easily caught! But enough about Fashion- this exhibition is all about Science! I had thought that the doors made an amazing racket, but the exhibition hall noise was beyond comprehension. It was somewhat like standing in the airship engine while making a steep ascension, with an entire percussive symphony playing their instruments at the same time. Startling and thrilling! After my experience with the door, I was careful not to get too close to the many exciting inventions on display. The local mining operations must be quite dangerous, as I saw several different mechanical arm replacements. There were some attempts to harness the aetherical energy for communication, but nothing as advanced as we Ladies already enjoy. There was an entire wing of mechanical beasts, ranging from giant clockwork draft horses to something that resembled a small mechanical badger. The clockwork beasts seemed realistic, in that they were as ill-tempered as live animals, and several of them had managed to break out of their cages. Between the rampaging badgers and the copious amounts of oil on the floor, I deemed that wing too dangerous to visit today. Perhaps tomorrow they will have wound down enough for viewing. I’ll save the most intriguing area of the exhibition for tomorrow’s letter. I want to spend more time delving deeply before I even begin to describe these inventions. Thank goodness Mr. Thistleby was on hand to save Miss Coraline in her fashion emergency, as it were. Perhaps that’s the reason why bustles and mechanical doors don’t both exist in this day and age – it’s a logistical impossibility! Ahh, science, fashion and technology. No wonder she was willing to make such a journey (I certainly would!) I hope she was able to discuss some of her new Airship technology with the other attendees. But perhaps that will come in the next letter, if the mechanical badgers allow. Now that’s a phrase I never though I’d find myself writing! And on that amusing note, I’ll leave you until next time. Many exciting collaborations in the works and much to share with you soon! 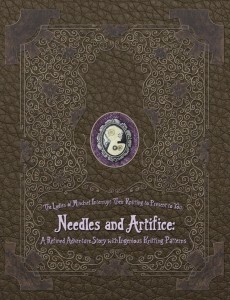 Buy Needles and Artifice (softcover) directly from us! The Ladies’ fanciful brooches are the product of Velvet Mechanism, and were created specifically for this book. Be sure to check out her other lovely jewelry!